Murrandoo Yanner told Pauline Hanson "you're not welcome here". Our message to the Hanson-Turnbull cabal should echo Murandoo Yanner's: "You are not welcome to keep spewing your racist hate across this country," says Ingrid Matthews. IF YOU have not seen the footage of Murandoo Yanner banishing Pauline Hanson from the Cairns Indigenous Arts Fair, it is well worth the 26 seconds so check the video below. The weekend this clip was posted, I was preparing my first ever property law seminar, Basic Concepts in Property Law. Serendipitously, Yanner v Eaton  HCA 53 was on the reading list. Mr Murandoo Yanner, a Gunnamulla man "of the Gangalidda tribe," appealed against a fine issued by Mr Eaton of the Queensland Police Force. He won in the Magistrates Court, however, Eaton won an appeal to the Queensland Supreme Court. Yanner then appealed to the High Court. Mr Eaton was joined by four Attorneys-General. The appeal was allowed, which is the mild-mannered way the High Court has of saying that Yanner won his case. Order that each of the Attorney-General of the Commonwealth, the Attorney-General of the State of Western Australia, the Attorney-General of the State of South Australia and the Attorney-General of the Northern Territory pay to the appellant the additional costs incurred by him by reason of the intervention of that Attorney-General, such additional costs to be taxed. This is one of those slap-downs that nobody ever says is a punishment because the law gets to define things. Costs orders send a strong message to the parties and costs orders against four Attorneys General are as strong a message as any from the High Court. But we are not allowed to say the order is a punishment or remedy, because punishments and remedies (fines, jail terms, damages awards, injunctions) are issued under a different curial function to costs orders. This itself is determined by the High Court, by which all other courts are bound. But in lay terms, four wrists were slapped. A fifth wrist was too, when the entire seven-judge High Court bench doubled down and ordered Eaton to pay Yanner’s costs in the Queensland Supreme Court too. The recording cuts in as Yanner is saying "Aboriginal people" and he continues "and now you’re kicking the Muslims around. Go, go," he says, waving Hanson and her entourage away. "You’re just a racist," he tells her. "Disgraceful. You are a woman lacking moral fibre. You are intellectually dishonest, and you’re not welcome here." Hanson turns around and leaves. As she does, cheers and applause can be heard from people off-camera. The direction to leave the premises, the reasons given and the cheers and applause, all contain important lessons in basic concepts of property law. Especially when the clip stars the man whose spectacular 1999 High Court win is also prescribed reading. And especially when there are considerable numbers of young Muslim Australians enrolled at my university. But would it be proper to show in week one? I messaged a mate doing his PhD at Melbourne Uni, a Ngunawal man whose judgement I trust absolutely and who has also taught undergraduate law classes. "Should I show the Yanner clip?," I asked. "What will it add to the lesson?," he replied. "Right to exclude, moral grounds for exercising right to exclude, community consent and consensus," I said. "Go for it! !," was his wise reply. "Is that the Yanner from the case the High Court case? Is that the same man?" "Yep, that’s him. He's a strong Aboriginal man and stands up for Muslims too." The dominant political news this week is yet another ugly announcement on asylum seekers. Its point would be lost without what Tim Dunlop refers to here as Turnbull being aided and abetted by the political media. It is worth quoting Dunlop’s bullseye prediction at length. Now picture any news coverage from the past two days. Any broadcast, any social media news feed, any bulletin, any hourly update, the latest headlines, any online news site, or op-ed, or analysis, or print edition. Has there been unambiguous condemnation of the racist hate and petty wedge politics gurgling from our political leadership? The story is that the Prime Minister and his Minister for Immigration and Border Protection are going to table a bill which, if passed, will outlaw people who have sought asylum in Australia from ever entering the country, based on one mode of transport — boat. This is the mode of transport by which Turnbull and presumably Dutton’s forebears, as well as every single person prior to the commercial aircraft industry, reached what is the largest island in the biggest ocean on earth. Until around 60 years ago, for around 60,000 years of human occupation of this giant archipelago, there was no other way to get here. The boat obsession (as I have written before), is unreal. It is obscene. It is the right to exclude on racist steroids. Yet Malcolm Turnbull and Peter Dutton, like Tony Abbott and Scott Morrison before them, are choosing, for reasons of their own aggrandisement and absolutely no other cause, to disseminate yet more utterly unnecessary racist hate across the country. Naturally, given the message makes for such compatible bedfellows, Pauline Hanson took credit for the government decision. Like Abbott and Morrison and Turnbull and Dutton, bigotry and hate-mongering are her favourite pastimes. "You’re just a racist. Now you are kicking the Muslims around. Go, go… you’re not welcome here." You come on my land, I sue you in trespass. Of course, there is no action in trespass if I invite you on to my land (the police are particularly sleazy and tricksy with this one. Be warned). Similarly, the law on country requires asking permission. The right to exclude is rarely needed when people have respect, and abide by the rule of asking permission. Legal systems regulate human behaviour across a society. All cultures have rules about leaving our own place and entering neighbouring land. The English law, which is based on the English value of land as a source of wealth, emphasises the right to use and enjoyment, the right to exclude others, and the right to alienate — to transfer your interest in land to another (sale, succession). Obviously no-one would ever accuse the English of being internally consistent — they trampled across the world with their guns and bibles, breaching their own rules with vicious abandon. This differential application of their own principles is both a source and a product of deeply racist imperial violence. But on this continent and her islands, for 60,000 years and counting, the central value is that the land is the source of the law (Black 2011). To harm or do wrong by the land is to harm or do wrong by the society. Before crossing a border, a person with authority to speak for country must give permission. The visitors are then welcomed to country. As in many cultures, this is a public ritual which endorses or verifies individual's actions. This is not a complex proposition. In white law, depending on the type of land (public, private, rented etc) permission to enter is required, whether from the owner, tenant, caretaker, ranger, or other official. We might enter a park without authorisation and be issued with a notice or a fine. We might ring a doorbell, or knock on wood, bring a bottle, wait to be offered a seat. "Come in!," we say. "Please, have a seat! Can I get you a drink?" These are host and guest norms for what we conceptualise as the private sphere; just as trespass and permits govern the wider social, or public, space. The norms and rules are shared with and taught to all members of a society. In short, every culture on earth has systems of rules and norms for human interactions in different spaces. Australia is home to the oldest continuing culture on earth. This is one reason that Welcome to Country is not some token ritual or nod to political correctness, as many seek to portray it. A Welcome to Country is the continuation of host and guest traditions established over 60 millennia. So who is welcome here? It is telling, then, to see how the bad-cop-worse-cop trash talk that passes for public debate these days is playing out. Hanson took credit for the government hate-mongering on refugees, adding "refugees are not welcome here". Right on script, Turnbull was given all the airtime and column inches he wanted to intone gravely, in his favourite paternalistic voice, what a great country this is for resettling refugees. "The most successful multicultural nation," he lectures us, with added erasure of First Nations people here, who have been developing multicultural protocol across 300-700 nations since megafauna roamed the earth. Never mind the millions of words, the how many reports, including from the UN Committee Against Torture, the Senate Inquiries, the shameless bullying (and probably illegal inducement to leave) of Human Rights Commission President Gillian Triggs, the rapes, the murders, the self-immolations, the forced birth, the staff who sexually abuse children, the billions upon billions of dollars to corporate donors which run our "off-shore detention centres". "Refugees are welcome here," Turnbull lied, disgustingly and his media cheer squad cheered. He must have some special plan up his sleeve, they hinted, in their increasingly desperate delusion that Turnbull is not really like this. But Turnbull really is like this. He really, really is. Our crimes – a crime scene since 1788 as First Dog On The Moon, depressingly but accurately, put it this week – can not be sprinkled with fairy dust by a Stockholm syndrome legacy media who depend on leaks and tips rather than do their job (Andrew Elder’s searing analysis of dysfunctional media dynamic here. Some future third-country settlement will not make the list of our gross human rights violations magically disappear. Who even thinks like that? Well, political columnists from The Guardian to Fairfax to the ABC do, for a start. Which leaves only the independents like New Matilda and Independent Australia for anyone of basic human decency to read. Thank goodness for new media, because when it comes to Malcolm Bligh Turnbull, the fourth estate – whose duties include mediating the conversation of the demos ie between the public and political leadership in the modern nation state – has been derelict indeed. “I have been engaging with Indigenous communities and First Australians throughout all my time in public life and before that, but particularly as Prime Minister,” Turnbull lied, disgustingly, on his Abbottesque tour of remote communities this week. And the media cheer squad cheered, creating the impression of community consent and consensus that cheering creates. 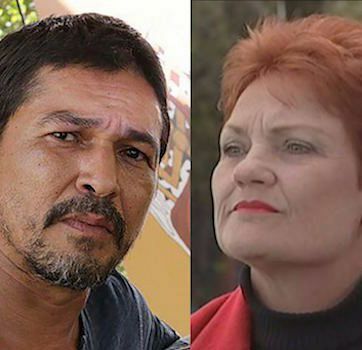 When Murandoo Yanner asserted the right to exclude Pauline Hanson from premises on grounds of racism and intellectual dishonesty, the crowd clapped and cheered, showing community consensus; and Hanson, knowing the rules, left. She then took to the media to blather about alcoholism, just as Turnbull did in Yalata, because they both know how these things operate in the media and public sphere too. What a repulsive pair. In their castles of sand, telling their mountains of lies, exercising the right to exclude people from this Aboriginal land, people who are fleeing persecution including wars in which we participate and all to the manufactured sound of a falsely-constructed consent. "You don’t care about Aboriginal people. Now you are kicking the Muslims too. You are just a racist. Go, go. You are lacking moral fibre. You are intellectually dishonest and you are not welcome to keep spewing your racist hate across this country." Ingrid Matthews lectures in law at the University of Western Sydney. You can follow Ingrid on Twitter @iMusing or her blog Oecomuse. A few short months ago, Turnbull said Hanson *is not welcome in the parliament* Now he's singing from her song sheet. Journo: "Pauline Hanson said... refugees aren't welcome in Australia… is she correct? Informed journalism for informed citizens. Subscribe to IA for just $5.